Wiley Rein has been engaged in unmanned aircraft systems (UAS) matters since the outset of the Federal Aviation Administration (FAA) opening the door to commercial uses. Drawing on its wealth of experience representing clients before regulatory agencies, obtaining necessary authorizations and licenses, and advising clients on regulatory obligations, Wiley Rein has been significantly involved in the evolving legal landscape of UAS. Wiley Rein represents clients from the telecom, media, insurance, commerce, aviation, agriculture, higher education, and manufacturing sectors. Wiley Rein’s comprehensive UAS Working Group is well-suited to assist clients on multiple fronts in this unique, complex, and dynamic area. The UAS Working Group includes lawyers, policy advisors, and engineers experienced in aviation issues at the FAA, as well as privacy considerations at the Federal Trade Commission (FTC), the National Telecommunications and Information Administration (NTIA), and Congress, and spectrum needs being examined by the Federal Communications Commission (FCC), NTIA, U.S. Department of State, International Telecommunication Union (ITU), International Civil Aviation Organization (ICAO), and industry working groups. Aiding clients in the preparation and filing of FCC experimental license applications for authority to test radio systems for use with UAS. Through our partnership with SIGNAL Group's Aviation team, the firm combines its traditional experience in UAS regulatory issues with a deep understanding of the fundamental policy issues driving industry performance and growth. As innovative technologies force convergence of new concepts and ideas, SIGNAL/Wiley Rein is able to provide the services demanded to drive market and regulatory solutions. 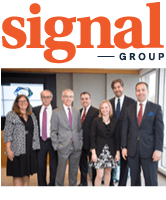 Click here to learn more about Wiley Rein and SIGNAL’s UAS capabilities. My Company Has Been Accused of Patent Infringement; What Do I Do Now? Federal, State, and Local: How Can We All Get Along?